As I've said in the past, I'm a geek. I happen to also like to cycle. This leads to some interesting (to me) crossover between the different technologies that exist. For example, I've been GPS tracking every ride since 2012. I find that it keeps me motivated, it provides me historical data for comparison and it can give me something to strive for. In terms of goals, for example, in past years I have undertaken challenges to bike every street in College Heights, to crest every hill in PG, to reach a set number of kms in the season (e.g. to Vancouver and back). Theoretically without GPS I could track kms travelled but it would tricky to organize. You can see that I'm starting each cycling year earlier and generally speaking going longer and faster each year. My first ride of 2015 would have been at least a 22 km ride and much better for speed but I blew a pedal so had to limp to get a ride home. C'est la vie! 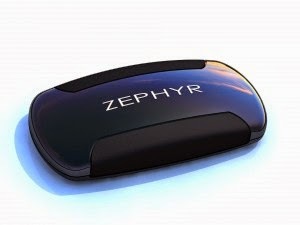 I've spent the last couple years using a Zephyr Heart Rate Monitor (HRM) which gives me a variety of information. I can tell you, for example, that my average heart rate has come way down - generally averaging between 15-20 bpm less across the entire ride. If I look at my early rides in 2014, I spent 47% in zone 5. That's pretty much as hard as your heart can pump without bursting. The other largest zone was 46% in zone 4 which is a normal race pace zone - healthy aerobic activity. By comparison, even my first ride of 2015 was much better - 5% in zone 5 and 76% in zone 4. This is considering I was doing much more vertical elevation and pushing much harder. I can also see concretely my recovery rate after exertion is much faster - when I first started with an HRM it would take me a couple kms to recover after a strenuous hill climb. By comparison, I'm back to recovery within a couple city blocks now. And that's on the first ride of the season - not after I've spent months working at it - so the results maintain over a relatively long period of time. The numbers that I haven't moved are ones like weight and BMI. I generally gain over the winter months and lean down over the spring/summer/fall months but I'm still heavier than I'd like to be. In terms of less measurable numbers I have almost completely eliminated lung illnesses and I almost never use my bronchodilators or corticosteroids (maybe 1-2 times a year now). I have never been able to recover my peak expiratory flow - I still sit at around 2/3 of a healthy adult male - but the medical theory is that this is a result of the scarring that I have present within my lungs. My oxygen saturation is good and I recover quickly after aerobic exercise so clearly not a major issue. I still can't swim for beans and I don't really feel comfortable running but after 3+ years working at the biking it definitely looks worlds closer than it has. Thank you Jon for poking, shaming, leading by example and otherwise motivating me to actually do something with myself. What next? More biking! I'd love to get some more gizmos - tracking oxygen saturation and blood pressure while riding, tracking bike cadence... heck I'd love to have something that would track my swimming strokes while I'm at it. If there is a moral to this story, pick whatever the heck motivates you to keep exercised and stick to it! Tracking data doesn't motivate everyone but if it does then hopefully some of the information above will get you started.